As star closer Craig Kimbrel continues to wait for a new contract, Dan Hayes of The Athletic raised the notion recently (subscription link) that the Twins could position themselves as a landing spot. Kimbrel has reportedly been seeking a five-year deal, though Hayes reports the Twins would only be interested in a shorter-term pact with a high annual value. As Hayes explores, the Twins’ recent but failed bid for Yasmani Grandal suggests that they’re willing to make a run at players they deem to be unique assets in the market. None of that is a declaration that Minnesota is actively pursuing Kimbrel at the moment, but the connection is still of some note. Were Kimbrel to take a contract of three or fewer years, it’s fair to speculate that he’d look to topple the $17.33MM annual value record for a reliever — currently held by the Rockies’ Wade Davis. Recent comments from Twins baseball ops leaders Derek Falvey and Thad Levine largely downplayed the possibility of any marquee addition to the roster, and Kimbrel would see enhanced interest from more than just Minnesota if his asking price dipped to three or fewer years. With a 2019 payroll that currently checks in more than $20MM south of last season’s Opening Day mark and zero guaranteed contracts in 2020, the Twins arguably have the most financial flexibility of any team in baseball, though that hardly means they should be expected to make a big free-agent splash. Speaking of the Twins’ interest in Grandal, Darren Wolfson of 1500 ESPN/SKOR North reported in a recent podcast episode (Twins talk starts around 11:50 mark) that Minnesota was willing to go to three years at a total of $13-15MM per season in order to bring Grandal aboard. Grandal’s camp, however, told the Twins quickly and definitively that he wasn’t interested in signing there. Given that Grandal landed one state over in Wisconsin, it’s unlikely that geography played much of a role, so perhaps signing with a clearer contender was a priority. Since signing, Grandal has also spoken about the emphasis he placed on finding an annual value commensurate with the game’s top catchers. It’s rare to see a player turn down three or four years (the latter reportedly offered by the Mets) in order to receive an AAV boost of this size, but every player is wired differently, and Grandal may simply be more open to risk than most. If he has a strong 2019, he could come out ahead next offseason when he won’t have a qualifying offer hanging over his head. While the Kimbrel scenario may not be all that realistic for Twins fans, Minnesota is still looking to add a reliever, tweets MLB Network’s Jon Heyman. Right-hander Ryan Madson is among the players Minnesota is considering as the team looks to further deepen its ’pen, Heyman notes. Madson logged 52 2/3 innings with 9.2 K/9, 2.7 BB/9, 1.20 HR/9 and a 42.6 percent ground-ball rate in 2018 — solid secondary numbers that generally look more appealing than his 5.47 ERA. Beyond that, Madson’s velocity actually improved over its 2017 levels, as he averaged 95.9 mph on his four-seamer and 95.4 mph on his sinker, per Statcast. Madson also posted a 13.9 percent swinging-strike rate that was his best since returning from a three-year injury absence in 2015. The 38-year-old was used heavily in the postseason by the Dodgers and looked to wear down in the World Series after strong showings in the NLDS and NLCS. However, he posted an intriguing 31-to-5 K/BB ratio from the All-Star break through the completion of the World Series and figures to come at an affordable rate. Meanwhile, Wolfson tweets that the Twins have both Madson and righty Bud Norris on their radar. However, he notes that the Twins have also been hoping to add relievers on minor league contracts, and it doesn’t seem likely that either Madson or Norris would be amenable to such a deal at this juncture. Norris worked to a 3.59 ERA 10.5 K/9, 3.3 BB/9, 1.25 HR/9 and a 42.6 percent ground-ball rate in 57 2/3 innings with the Cardinals last season. 6:18pm: Ken Gurnick of MLB.com reports that the Dodgers were the team that placed the claim on Madson (Twitter link). 5:53pm: Nationals right-hander Ryan Madson was claimed on revocable trade waivers by an unknown team earlier today, reports Robert Murray of The Athletic (on Twitter). The Nationals and the claiming team will have 48 hours to work out a trade, which would give the two sides until early afternoon Friday to work out a deal. The Nats, alternatively, could simply allow Madson and the roughly $1.36MM remaining on his salary go for no return other than full salary relief. Madson, who turned 38 yesterday, is in the final season of a three-year deal and will reach free agency at season’s end. He’s struggled to a 5.28 ERA in 44 1/3 innings this season and missed time on the DL due to chest and back injuries. However, he’s also averaging a career-best 95.8 mph on his fastball this season and has posted solid marks of 8.3 K/9 and 3.1 BB/9. Much of the damage done against Madson has come in a trio of meltdowns this season, as he’s had a pair of outings in which he yielded four earned runs and another in which he was clobbered for six runs. For all of his struggles in 2018, Madson has a lengthy track record of quality results as a late-game reliever and has been highly effective in recent seasons. From 2015-17, Madson notched a 2.55 ERA (3.08 FIP) with 8.4 K/9 against 2.1 BB/9 in 187 innings for the Royals, Athletics and Nationals. If a deal is ultimately reached, he’d join his new team in advance of the Sept. 1 deadline for postseason eligibility and have a month to get back on track following a change of scenery. 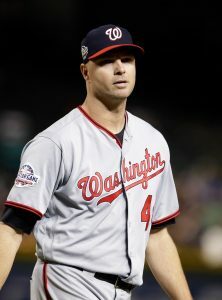 The Nationals placed veteran reliever Ryan Madson on revocable trade waivers yesterday, per Jorge Castillo of the Washington Post (via Twitter). He’ll be on the wire until tomorrow. It’s true, of course, that almost all major league players are run through trade waivers at some point. But the timing is still relevant, particularly in this case, as the placement kicks off a two-day waiver period. If a claim is made, the team that sought waivers (in this case, the Nationals) has another two-day stretch in which to work out a trade, pull back the player, or allow the contract to move to the claiming team without compensation. With Madson returning from the DL, and immediately thereafter hitting waivers, the Nats may have an opportunity to recoup some value — or, at least, save some salary — for the hurler. Having already moved veteran hitters Daniel Murphy and Matt Adams, and then lost pending free-agent reliever Kelvin Herrera to an injury, it seems likely that the D.C. organization will be quite motivated to move Madson. Though he’s now 38 years of age, Madson still delivers plenty of velocity. Indeed, he’s averaging a career-high 96.4 mph with his four-seamer and getting swings and misses on 12.4% of his deliveries. Those stats may help contending organizations look past some of the less-than-promising figures on Madson’s 2018 stat line. After posting a sparkling 1.83 ERA last year, he’s working at an ugly 5.28 clip through 44 1/3 innings this season, with only 8.3 K/9 against 3.0 BB/9. Opposing hitters are carrying a .326 batting average on balls in play and averaging a 13.0% HR/FB rate against Madson, both of which sit above his typical recent levels. His 66.6% strand rate also hints at some potential poor fortune. Whether those numbers are due primarily to natural variability or an erosion in his skills is a matter for scouts to assess. National League organizations will have first crack at Madson, who is earning $7.5MM on the season before reaching free agency this fall. Presently, the Dodgers and Phillies are the two clear contenders with the worst records in the league. Both could consider a move for Madson, though surely there are other players under consideration as well.